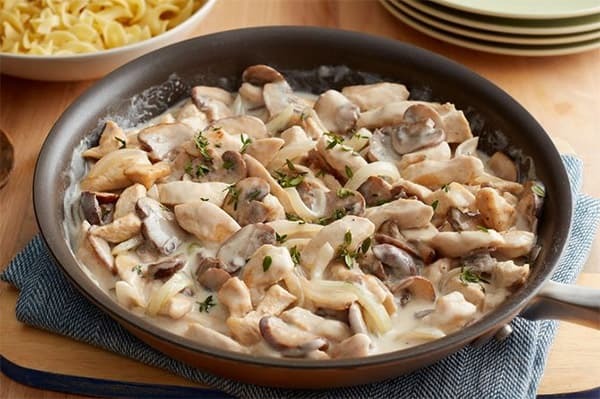 This simple stroganoff recipe is a wonderfully simple dish that only takes 6 ingredients to give your family a mouth-watering lunch or dinner. Use non-fat yoghurt to reduce some fats and any type of mushrooms you have on hand. Stir in some sweet Hungarian paprika and tomato paste, simmer for just five minutes, and you’re ready to serve. Slice chicken into thin strips. Lightly sprinkle with paprika. Cook until brown, remove chicken. Add onion to pan. Cook until softened, adding a little water, when necessary. Add mushrooms and cook for two minutes. Return chicken to pan. Blend yoghurt with tomato paste till smooth. Stir into chicken mixture and simmer for five minutes.